Johann Wolfgang von Goethe (1749-1832) perhaps comes as close as any man to deserving the title of universal genius. Poet, dramatist, critic, scientist, administrator and novelist, he was born at Frankfurt-am-Main in 1749, the son of well-to-do parents with intellectual interests; and he studied at the University of Leipzig and at Strassburg, where he wrote a play which initiated the important Sturm und Drang movement. 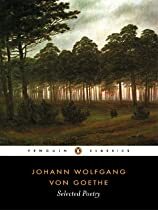 During the next five years he practiced law in Frankfurt and wrote The Sorrows of Young Werther, a remarkable novel autobiographical of one side of Goethe’s nature. In 1775 he went to visit the court of the young Duke of Weimar, and, except for an extended journey to Italy a decade later, stayed there the rest of his life, filling at one time or another all the major posts in the Weimar government. Here a close friendship with Schiller developed, and here he conducted important scientific experiments and published a steady stream of books of the highest order and in many different forms. He became the director of the Weimar Theatre in 1791 and made it the most famous in Europe. His life held a number of ardent loves, which he celebrated in lyrics that are compared to Shakespeare’s, and in 1806 he married Christiane Vulpius whom he had loved for many years. In later life Goethe became a generous patron of younger writers, including Byron and Carlyle. In 1790 he published the first version of his life work as Faust , a Fragment, but Part I of the completed Faust did not appear until 1808, while Part II was finished and published only a few months before Goethe’s death in 1832. Be generous with kind words, especially about those who are absent. Belief is not the beginning of knowledge — it is the end. By nature we have no defect that could not become a strength; no strength that could not become a defect. Keep not standing fixed and rooted. Briskly venture, briskly roam. Plunge boldly into the thick of life.